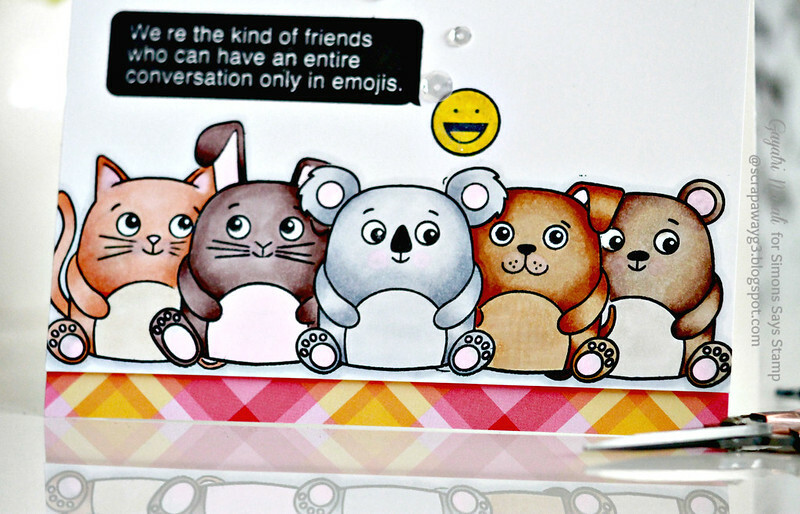 Have you seen the new release from Simon Says Stamp called My Favorite? Check it out! There are some gorgeous new stamp sets and dies released. All of them are available at Sion Says Stamp Store. 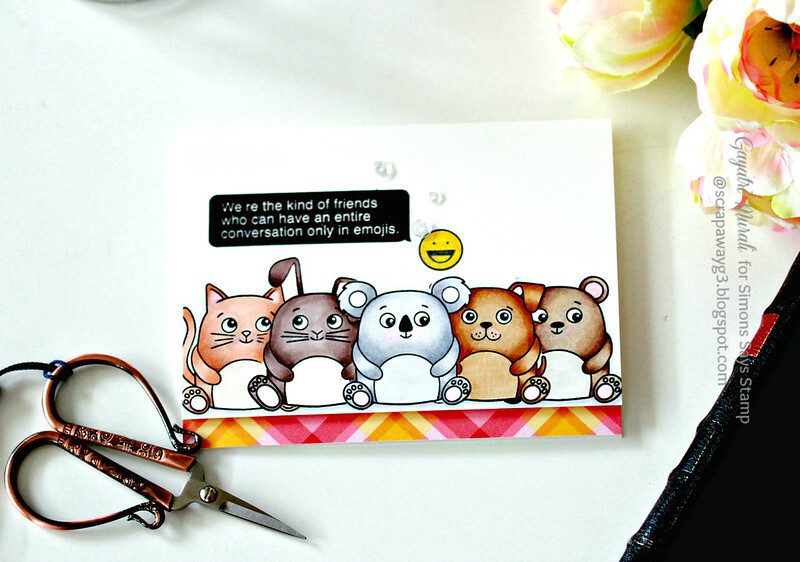 I have a card to share with you using one of the new stamp set called Cuddly Critters. This is such a cute stamp set. It has all the cute critters you need. There is a dog, cat, bunny, bear, a panda and a koala! Perfectly sized images and can be combined with any of the other accessories stamp set you many have with you. Or there is an accessory stamp set also available called Cuddly Critters Accessories Duh! Lol! Both the Cuddly Critters and Cuddly Critters Accessories comes with coordinating dies. I don’t have it so I have used an older set from Simon Says Stamp called Texting You to make my card. Hope you like it. I wanted to show you all the critters in the stamp set. So I masked and stamp them all next to each other and copic coloured them. How cute are they? Love all the facial expressions. They looked like emojis. So I used the Texting You stamp set for the sentiment and added an smilie emoji 🙂 Initially I wanted it to be a one layer card, but then I changed my mind after colouring the emoji. There has to more yellow to tie in the yellow emoji. So I trimmed the card panel and added the plaid pattern paper from Lawn Fawn at the bottom of the card. Now I have a bit more yellow colour and a bit of pink to make the card more fun. Finally embellished with Pretty Pink Posh Sparkly Clear Sequins. Here is a closeup of the cute cuddly critters for you!